Your curated guide to events happening across the state this weekend, from the mountains to the coast. This Weekend in North Carolina events are pulled from December’s Dates & Events section in Our State magazine. Learn more: (828) 669-8870 or themontevistahotel.net. Attend the largest and longest-running studio tour in western North Carolina to meet more than 100 craftspeople and artists working in every medium. The tour is a self-guided trip that will lead you to unique places in Yancey and Mitchell counties. Learn more: (828) 682-7215 or toeriverarts.org. At this exclusive evening event, the entire family can hop aboard Tweetsie’s signature black locomotive and experience the steam-powered ride along with a dazzling display of lights. Learn more: (877) 893-3874 or tweetsie.com. More than 2,500 luminaries will line downtown streets during this light display, which will also feature decorated shops. You can sip hot cider courtesy of kind shopkeepers or bundle up with your sweetheart on one of the carriage rides offered each night. Learn more: (828) 586-1439 or visitdillsboronc.com. The New Hope Moravian Church welcomes one and all to this festival of homemade crafts, which includes Moravian stars and hand-dipped beeswax candles. Fill up on hearty chicken pies and sugar cake, and warm up with coffee. Your entrance fee is simply a canned food donation for the local food pantry. Learn more: (828) 294-4802 or newhopemoravian.org. Don’t mistake Santa’s cookie addiction for a lack of physical fitness. For proof, head to Chimney Rock State Park to see him take on one of the world’s largest chimneys: Chimney Rock. Enjoy watching Santa’s rapelling technique while you eat his favorite cookies and sip hot cocoa. Learn more: (828) 625-9611 or chimneyrockpark.com. 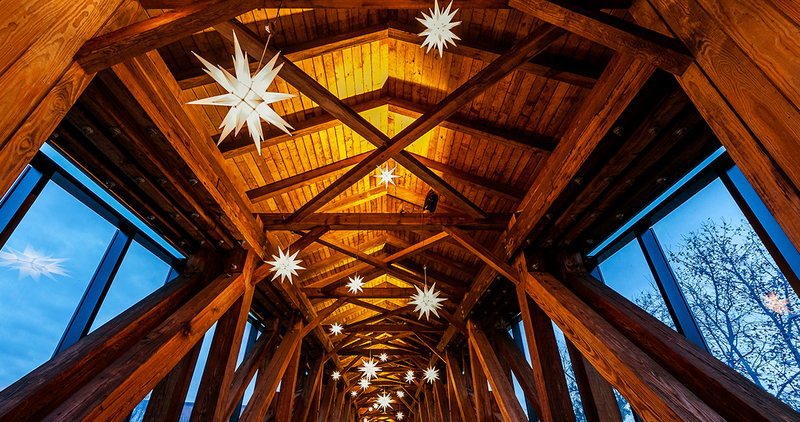 Experience a festive German Christmas market right in North Carolina. This signature holiday event at Olde Mecklenburg Brewery features an open-air craft market, craft beer, and comfort food. Learn more: (704) 525-5644 or facebook.com/oldemeckbrewery. In this comedic Christmas play, which has been performed by the Cape Fear Regional Theatre for more than 25 years, a couple struggling to produce a church Christmas pageant is faced with casting the most “inventively awful” kids in history. Learn more: (910) 323-4233 or cfrt.org. Kick off December in historic downtown Wendell: Visit with Santa; take a trolley ride; watch a light show comprising more than 400,000 lights and holiday music; and enjoy a cookie walk, live Nativity, and choir singing. Learn more: (919) 365-4450 or townofwendell.com. Enjoy entertainment by community actors, singers, and musicians before the 25-foot Christmas tree is officially lit just outside Town Hall. Then head inside for a reception and the unveiling of a second tree, which will be decorated with ornaments handcrafted by more than 120 community groups. Learn more: (919) 319-4560 or townofcary.org. This 14th annual craft show at St. Thomas More Catholic Church will feature more than 65 artisans and crafters from around the state, selling everything from pottery and jewelry to holiday decorations. Learn more: (919) 929-2241 or stmchapelhill.org. Celebrate the holidays with traditional and popular holiday tunes, performed by the Fayetteville Symphony at Methodist University’s Huff Concert Hall. The Fayetteville Academy Chorus will also join the symphony for several selections. Learn more: (910) 433-4690 or fayettevillesymphony.org. The Greensboro Oratorio Singers will present their 64th annual performance of Handel’s masterpiece at Christ United Methodist Church. Learn more: (336) 253-4878 or oratoriogso.org. Tour 10 historic homes and properties decorated in their Christmas finery. Learn more: (252) 204-9908 or preservationwarrenton.com. Enjoy a Victorian caroling concert on the front porch of the Poe and view the elaborate Christmas decor during this annual open-house event at the Museum of the Cape Fear Historical Complex. Learn more: (910) 486-1330 or museumofthecapefear.ncdcr.gov. More than 80 varieties and 10,000 individual poinsettias will be displayed in a sea of color at Mitchell’s Nursery and Greenhouse. Plants will also be available for purchase and can be custom-wrapped. Learn more: (336) 983-4107 or mitchellsnursery.com. Floats, bands, and Santa Claus will parade down to Federal Point Plaza on Friday night. At the flotilla on Saturday, boats decorated with thousands of lights will cruise from Snows Cut to the Carolina Beach Boat Basin and back. Learn more: (910) 458-5507 or islandoflights.org. Watch the annual tree lighting and flotilla, where lighted boats parade through Edenton Bay. Learn more: (252) 333-0655 or mainstreetedenton.com. After a Christmas tree lighting at 6 p.m., enjoy refreshments, live entertainment, visits with Santa, and carriage rides through town. Holiday celebrations will include a Nutcracker Tea Party, cookie contest, movie night, parade, craft festival, book sale, tour of homes, costumed history tour, the Southport Christmas Flotilla, and Santa’s workshop. Learn more: (910) 457-7927 or cityofsouthport.com. Candlelight tours will be offered through the eight rooms of the Manor House at Poplar Grove Plantation, which will be decorated by theme and color with natural flora and greenery inspired by the Foys’ colonial-through-Victorian family history — with a few contemporary flourishes to represent the family’s four centuries in coastal North Carolina. Learn more: (910) 686-9518 or poplargrove.org. This 60-minute narrated version of the classic Christmas tale, performed at Thalian Hall, is the perfect show for the short attention spans of younger fans. Learn more: (910) 632-2285 or thalianhall.org. Take a half-mile, self-guided walking tour through Airlie Gardens’ light display, which includes local food and beverage vendors, plus a visit from Santa. Learn more: (910) 798-7717 or airliegardens.org. Tour seven festively decorated homes, and do some holiday shopping at St. Paul’s Episcopal Church during this 16th annual event. Learn more: (252) 752-3482 or stpaulsepiscopal.com. Celebrate one of the coast’s oldest traditions at this 30th annual festival: Enjoy antique decoy exhibits, retriever demonstrations, kids’ activities, a head whittling contest, and decoy competitions with categories for every kind of carver. Save room for a shrimp burger. Learn more: (252) 838-8818 or decoyguild.com. The evening kicks off with a performance by the 2nd Marine Corps Band from Cherry Point. Later, watch a parade of lights on beautiful boats, and visit with Santa in Union Point Park. Learn more: (252) 639-2902 or newbern.recdesk.com. The whole family will enjoy this variety show organized by talented local singers at the Dunn Center at North Carolina Wesleyan College. Learn more: (252) 985-5197 or ncwc.edu. This downtown Rocky Mount tradition will feature live music by local marching bands, festive floats, classic cars, and Santa Claus. Learn more: (252) 972-1159 or rockymountnc.gov. Stroll through the decorated parlors of Bellamy Mansion, and enjoy sandwiches, scones, desserts, tea, a champagne toast, raffles, and live entertainment. Tickets are required. Learn more: (910) 251-3700 or bellamymansion.org. Since 1933, Our State has shared stories about North Carolina with readers both in state and around the world. We celebrate the people and places that make this state great. From the mountains to the coast, we feature North Carolina travel, history, food, and beautiful scenic photography.